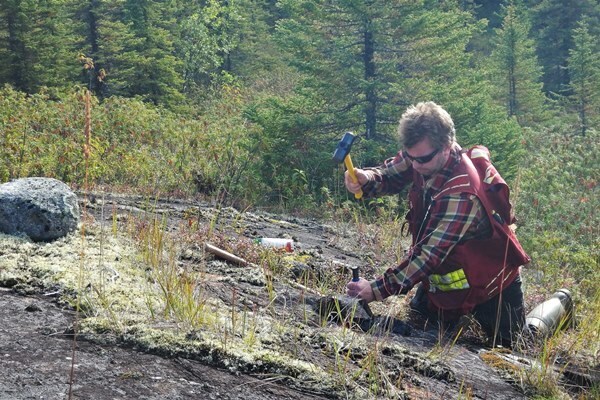 Mike Hodge, President & CEO of Saville Resources Inc., sampling a komatiite outcrop at the Covette Property in the prolific James Bay Region of Québec, Canada. With currently about 19.5 million shares issued, Saville Resources Inc. has recently restructured its share capital and this may provide significant updside. With a current market capitalization of $1.2 million CAD, Saville today announced the acquisition of its new flagship project (“Covette“) in the prolific James Bay Region of Québec in Canada. Have you followed the spectacular creation of shareholder value by companies such as Nemaska Lithium Inc. ($673 million CAD market cap. ), Critical Elements Corp. ($246 million CAD market cap.) or Galaxy Resources Ltd. ($1.5 billion AUD)? These 3 companies have something in common: Projects in the James Bay Region of Québec. This region is known for its world-class pegmatites. And Saville also has pegmatites on its newly acquired Covette Property. It‘s just not yet confirmed what those pegmatites are made of. President & CEO Mike Hodge was accompanied by geologist Nick Rodway to the Covette Property for a ground prospecting program in the 3rd quarter of 2017. All pegmatite outcrops they found on the property were sampled as this rock type could be a favorable host to lithium or other metals. Assays are pending and expected to be announced once available. A 1402 line-km VTEM survey was completed over the Covette Property by Geotech Ltd. in late 2016. This modern geophysics survey was a success because several high priority electromagnetic (EM) conductors were identified coincident with strong and distinct magnetic high anomalies, as well a broad and large coincident EM and magnetic high anomaly. These areas are considered prospective for base and precious metal targets. So Saville is not only hunting for potential lithium-rich pegmatites but also for other metals. Geologically, a greenstone belt underlies the region, comprised of various mafic to ultramafic rock units considered prospective for base and precious metals (nickel-copper-cobalt-PGE-gold-silver), as well as pegmatite hosted rare metals (lithium-tantalum). Komatiites have also been described in the region with such rock types known to host significant nickel-copper massive sulphide deposits at other localities globally, adding further to the prospective nature of the region. Historically, the Covette Property area has been subject to only limited exploration, which focused primarily on prospecting and sampling. Outcrop exposure in the area is limited. Historic sampling results include the pegmatite/amphibolite Clothilde Showing, where 4.7% molybdenum, 0.73% bismuth, 0.09% lead, and 6 g/t silver, as well as 1.2 g/t silver and 0.18% copper were returned from 2 grab samples, respectively. That’s a lot of molybdenum! Thus, Saville’s new property has the potential to host several deposit types with a diverse range of metals. It will be interesting to follow this project being explored over the next months. In order to do so, the company is currently restructuring itself by way of a new management led by its new President & CEO, Mike Hodge, settling debt with the issuance of equity, and raising funds for exploration, project evaluation and acquisition as well as general working capital. After the financing and debt settlement, Saville would have 28,416,714 issued and outstanding, translating into a market capitalization of about $1,705,00 at $0.06. Full version / The claim area consists of 65 contiguous claims, encompassing an area of approximately 3,370 ha (~34 km²).